Max Salminen, from Sweden, extended his lead at the Opel Finn Gold Cup to seven points after placing fifth in the only race possible on Day 4. Ed Wright, from Britain, remains in second, while Jonathan Lobert, from France moves up one place to third, on equal points with Wright. The race was won by the 2013 World Champion, Jorge Zarif, from Brazil. Salminen is the only sailor so far to retain his overnight lead, while most of the top ten remain the same, apart from Anders Pedersen, from Norway, who placed ninth today, and moves into the top ten. 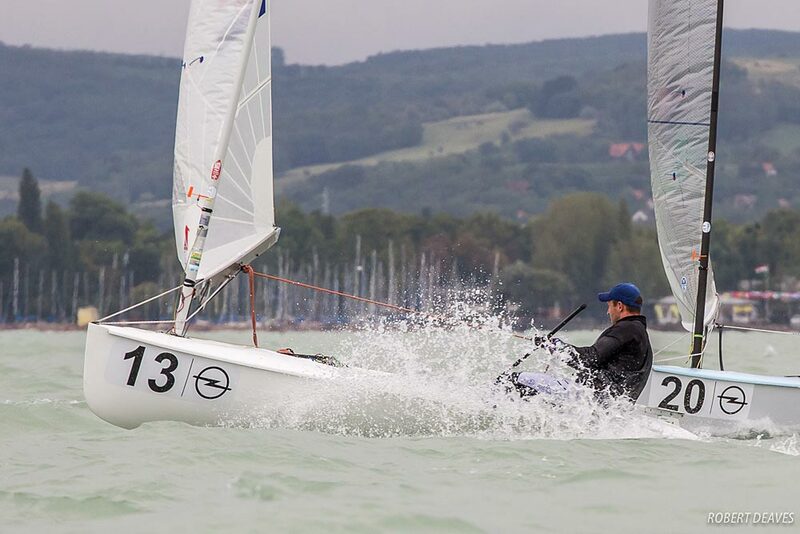 Credit also to Gerardo Seeliger, who celebrated his 70th birthday today with his best result of the series so far, finishing 86th and beating several sailors less than half his age. After six hours waiting for a stable wind, which shifted through almost 180 degrees during the morning and early afternoon, one late race was sailed in a slowly building breeze, topping out at 13-16 knots. Lobert made the best of the wet upwind as the wind increased past 10 knots and Oscar was raised at the top mark. He was followed round by Zarif and Nenad Bugarin, from Croatia. Bugarin has sailed an excellent series and would be a title contender but for two letter scores that have left him carrying 114 points, a very high price in a fleet of this size and quality. Zarif took the lead on the downwind and never really looked threatened for the remainder of the race. 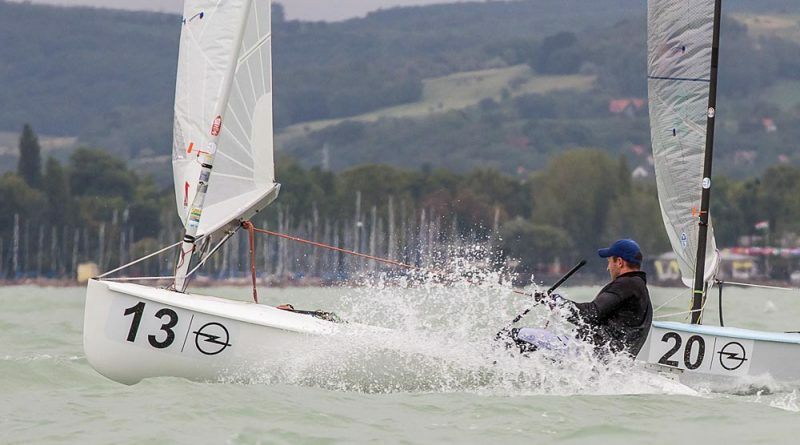 Lobert then came under pressure from Zsombor Berecz, from Hungary, on the second upwind, but just managed to stay in front. However Berecz went wider on the downwind and came into the final mark just ahead to finish second ahead of Lobert. Pedersen moves into the top 10 for the first time after a shaky start to the week. A second place moves Berecz up one place to fifth overall. Race winner Zarif says this week has been the worst regatta for him in several years, but he remains hopeful. 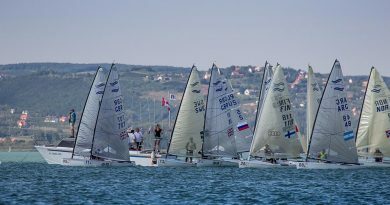 The points gap between the top eight is still pretty close, but in a fleet of 113 boats, a lot can happen very quickly, as many good sailors are finding out. The forecasts for Friday are again inconsistent, but some say there will be another slow start. Racing is scheduled to start at 10.00. Check out the links below to follow the racing on Twitter and Facebook. 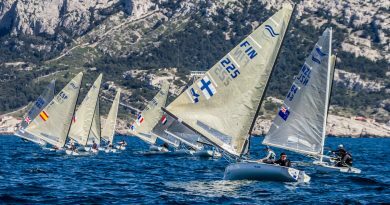 Most mark roundings and finishes are broadcast on Facebook Live through the Finn Class page. Highlights video to follow at FINN TV and on Facebook.